Nature created this abstract snow sculture in rural Rock Island County. It was colder overnight, in fact, colder than ever recorded in the Quad Cities. The National Weather Service in Davenport says the low temperature at the Quad City Airport was minus -33 degrees. That breaks the all time record low of minus-28 which was set on February 3rd, 1996. Of course, that breaks the daily record, too. 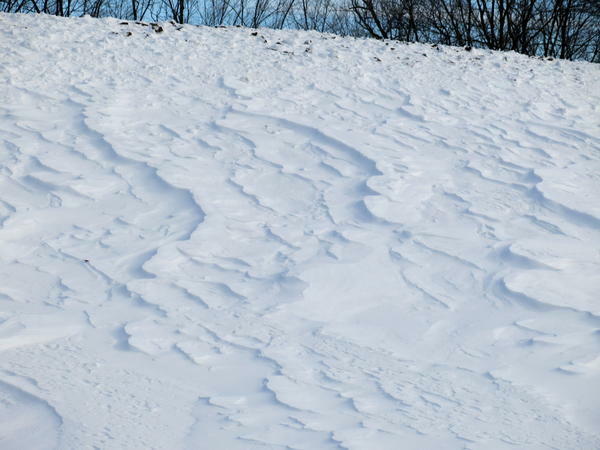 Meteorologist Tim Gross blames very cold Canadian air with snow cover and clear skies. Wednesday's weather broke another record, too. The high temperature of -8 was coldest for that date and broke the old record of -2 set on January 30, 1951. 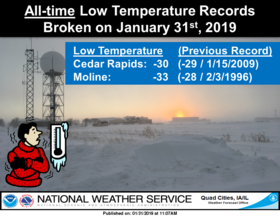 It is possible the statewide record low may have been broken in Mount Carroll, Illinois with an unofficial reading this morning of -38. It won't be official until an Illinois climate extremes committee reviews it, which could take up to two weeks.